The jackdaw (Corvus monedula) also known as the Western or Eurasian jackdaw belongs to the passerine group of birds and is a small member of the crow family which also includes rooks, ravens, jays, choughs and magpies. 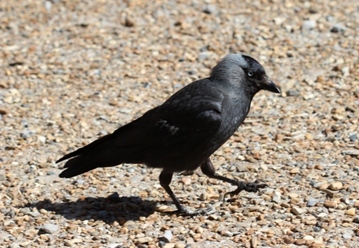 The jackdaw is approximately 33cms in length with black feathers, which are very shiny around the head, silvery grey around the nape and front of the neck, and their eyes, which are very distinctive, are pale grey. They are omnivorous and are able to take advantage of a wide choice of food such as insects, seeds, worms and even household scraps. They are very sociable, noisy birds and commonly roost together in woodland or on cliffs - the collective noun for jackdaws is a train or a chattering. In the UK, survey work suggests that there are over half a million resident breeding pairs spread across all parts except the far north west of Scotland. They can be found across Europe, the Indian subcontinent, Asia and Russia. Prior to the 16th century these birds were known simply as daws and the addition of jack alludes both to its small size and the fact that, like magpies, they love bright objects which gives rise to the other meaning of jack - a thief. Historically, jackdaws have been associated with bad luck and the ancient Greeks believed them to be narcissistic, foolish creatures. Aesop's Fables feature a story of a vain jackdaw who sought to become the king of all birds by wearing a cloak of other birds feathers but he became ashamed when they all dropped off. In Wales they were considered to be sacred because of their habit of nesting in church steeples and were therefore shunned by the devil. The species mate for life and their nest sites tend to be holes in rocks or trees or out of choice a good, old fashioned, open chimney where they nest year after year adding fresh material each season which gradually blocks the chimney. If a chimney is not used for a fire for a time it is amazing how quickly and how much twiggy material they can pack into the space. 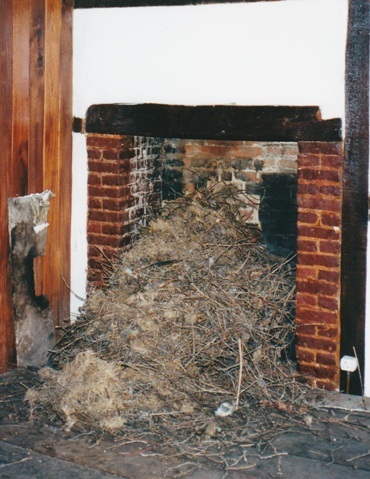 A few years ago, during renovation work, the chimney in the main room of Stone House Farm was cleared of a jackdaws nest which could have filled a few wheelbarrows. Cold weather, or as the media put it "an Arctic blast", is forecast to arrive in the third week of November which will mean that the numerous sightings of red admirals in the garden over the first two weeks of the month will be the last butterflies we are likely to see on the wing before spring next year. Meanwhile herons from the heronry near Reigate Hill have made an early start to their regular visits to village fishponds in search of food and, as a result, before we put the winter nets over the pond the heron had paid us an early morning visit and taken the stock. Talking of nets, woodpigeons have begun their annual migration down the east coast on their way to the warmer conditions of the southern counties, so for vegetable gardeners it is time to protect winter cabbage crops.